Time sure does seem to fly by. We are getting down to the end of 2016 and our dividend income keeps growing. That is the thing I love about dividend income. As long as you are willing to put your money to work for you … it pays you back over and over. We bought our first dividend stock over 8 years ago, back in 2008. Since that time we have gone from earning less than $100 a year in dividend income to averaging well over $100 a month now. We still have a long way to go in building our dividend income portfolio, but I think we have built a solid foundation. 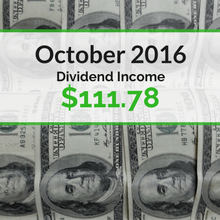 October is always one of those “other” months it seems like when it comes to earning dividend income. The good news is that this past month still generated over $100 in passive income. When I write these dividend income articles, I like to compare our monthly results to the same time period in the past. This tends to be a great way to see how our overall portfolio is growing since we are usually comparing the same companies from years past. We saw an increase of over 16% last month compared to October 2015! Just look at the growth compared to last year where we are up by over $15 in dividend income. As long as these numbers continue to grow each year at a moderate rate, I know that we are building a solid and sustainable income stream. 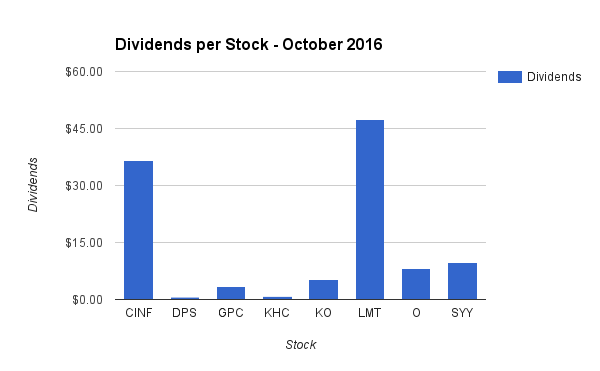 Note – All of the dividends we currently receive are reinvested into new shares of the same stock using DRiP – except those purchased through our LOYAL3 and Robinhood accounts. Note – All of these investments were made through our Robinhood account … which means we did not pay any commissions or fees on these trades. I don’t always report our 12 month forward dividend income. However, we recently set a goal to grow our forward annual dividend income to $3,000 by the end of next year (2017). We have given ourselves 14 months to accomplish this and believe we need to invest $20,000+ to make it happen. So I have decided to start reporting these numbers again so we can get an idea of where we stand each month. I wanted to compare last October’s results (2015) to this year to show how much we have grown. Our 12 month forward income grew by 24.5% this past year! That is an increase of $416.22 in future dollars. Note – The majority of the increases will come from new investments over the next 14 months. 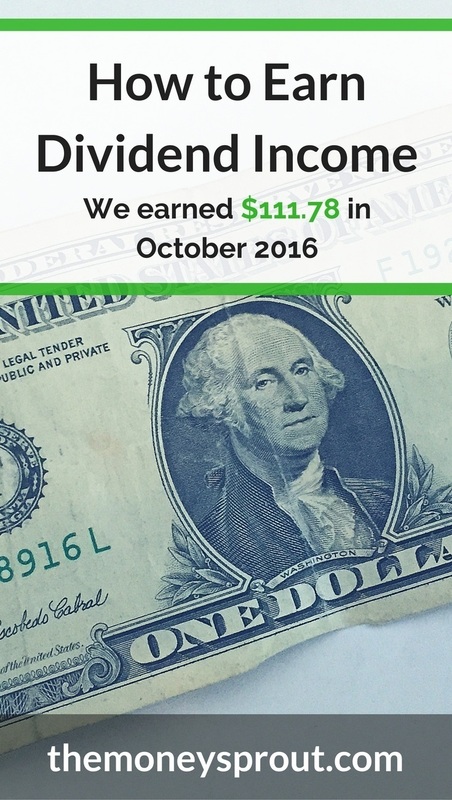 The dividend income earned in October ($111.78) was up over 16% from the same time last year. This is another indication that our portfolio is constantly growing. As I mentioned earlier – the growth is from the combination of dividend increases, reinvested dividends, and new investments. To date, we have earned a total of $1,524.80 in dividend income for 2016. This is the first time that we have earned over $1,500 in dividends in a year. The good news is that we still have 2 solid months to add to our total! At this rate, we would earn around $1,925 in annual dividend income this year. Unfortunately our goal to earn $2,250 in dividend income during 2016 is out the window. Not saving and investing enough of our income has kept us from hitting this years target. All is not lost though. Earning over $1,900 in dividends is a huge jump from $1,475 last year and still a solid number. It certainly would be awesome if we could squeak past $2,000 though! 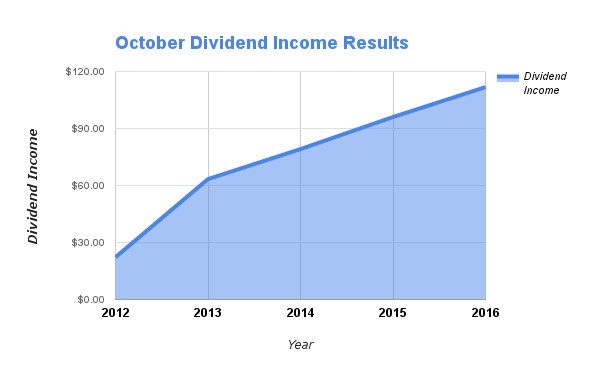 How was your dividend income in October? What stocks are you buying in this market? Full Disclosure – At the time of this writing, we owned shares in the following stocks noted in this post – ADM, CINF, DPS, GPC, KHC, KO, LMT, O, OHI, and SYY. The material above is not a recommendation to buy. Please do your own research on a company before deciding to invest.